So another week and a half has gone by and this blog once again has been neglected. So much has been going on lately so it's time for another update. We made our trip to IKEA to purchase all the baby furniture and have managed to put it all together without too much damage to our credit card or our marriage!! We've had our heart set on a particular change table/chest of drawers unit from IKEA for over 1 1/2 years now and when we got to IKEA it had been slashed to half price cause they were discontinuing it. We're thinking - BARGAIN! But so was everyone else and there didn't seem to be any left in the warehouse area. We started to freak a little, wondering what we would do when my mum piped up (mum and dad came along to help us with all the lifting and stuff cause I'm not allowed to) that we should ask if we can have one of the floor models (there were 3 upstairs all set up). 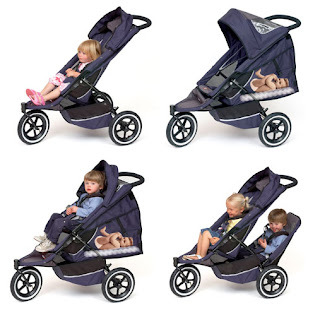 So we eventually got one of those and cause it was floor stock that knocked another $50 off. And it was all set up!! So pumped about that. 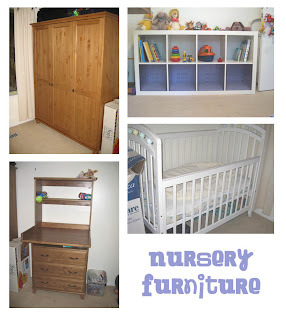 We also bought a wardrobe as this bedroom doesn't have one and one of those cubed Expedit bookcases which as you can see we've turned on it's side - that will be for toys, books, etc... We already had the cot. Had a great ANZAC day yesterday. Had brekkie with my family at my mum and dad's house - bacon, eggs, beans, mushies, juice, toast. Yum Yum Yum. Andrew and I then spent the day in the backyard - lawns are mowed, some weeding has been done. Looking a lot better than it did a couple of days ago. It's really annoying me that some of our plants are dying off but the weeds are managing to grow bigger than ever. What the!?!?! Anyway, I'm off to hang some washing out, do some scrapping and then watch the Biggest Loser finale tonight. GO PATI!! So I am back. It was a bit longer than I planned but it took a little while to find the time to sift through the photos. Warning semi long post ahead!! 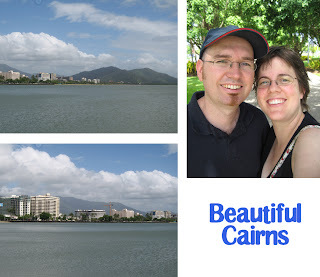 So Cairns was so much fun and we had such a great, relaxing time. We "survived" the tsunami warning - we decided to go for a drive inland just in case. You can never be too careful. We saw some beautiful things that day. 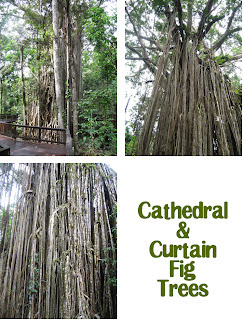 The world famous Cathedral and Curtin Fig trees, some gorgeous waterfalls and we had lunch at a gorgeous little place called Mungali Dairy. It was so cute and the food was awesome. 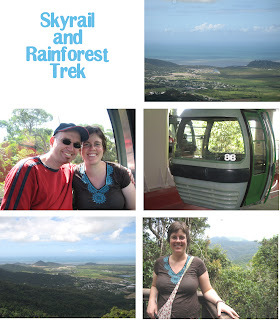 We also went on the Skyrail, which is a cableway up the side of a mountain and takes you through rainforest. It was so beautiful and there was opportunities to get off at a couple of stations and walk around some boardwalks through the rainforest. 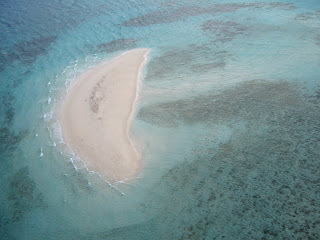 And the last big thing we did was our boat trip out to the Outer Barrier Reef. We snorkelled at two different spots and then caught the helicopter home. It was a pretty rocky trip out to the reef. The wind was about 20 knots which apparently is a little rough and I don't usually get seasick but I was feeling pretty green by the time we got to the snorkelling spot. No-one else had actually been sick so I was determined not to be the first to blow chunks!! The snorkelling was amazing. I was a little scared at first. Never been out in the middle of the ocean without land in sight and also I was a little worried about what might be lurking below. But I soon got over that as we got closer to the fish and the coral. We saw so many different fish and coral. The colours were amazing and I have never seen anything like it before. We had an underwater disposable camera so we took some photos. Haven't had them developed yet so it will be interesting to see how they come out. I just couldn't believe how close to the fish and the coral we got. The fish were brushing past us. Kinda creepy and cool all at the same time! And the helicopter ride home was unbelievable. 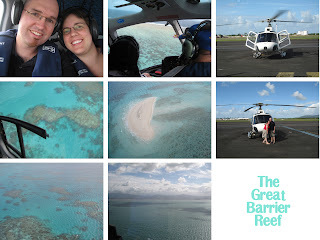 Neither of us had ever been in a helicopter so to go in one over the Great Barrier Reef was an unforgettable experience. The pilot was a bit of a daredevil and did a few swoops close to the water. Very cool. 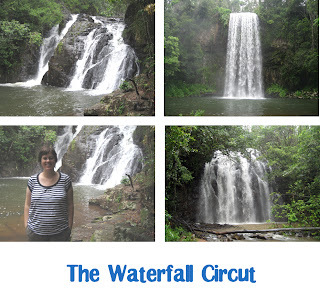 The rest of our time was spent relaxing, reading, bumming around, went on a couple of drives to Port Douglas and other little beaches. Was such a great time and a great way for us to spend some time together before little Squirt arrives. Yes we have a interim name - Squirt. After the baby turtle from Finding Nemo. So that was our holiday. We went baby furniture shopping when we got back but I'll post all about that, with some pictures tomorrow. I think I've blabbed enough today. So we are back from Cairns. Got home late Tuesday night. We had an absolute ball and feel so relaxed now. Spent yesterday washing, tidying, organising. All those post holiday things. Don't have time to go into the whole holiday overview right now. I'll be back later tonight to do that. Have to go through our 400+ photos and pick out some good ones to share with you all. Just wanted to leave you a taste of the photos to come. 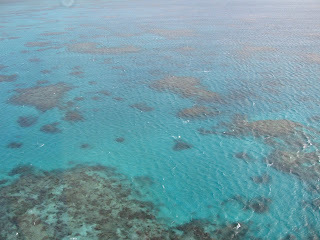 These were taken on our helicopter ride across the Great Barrier Reef. Yes that's right - A HELICOPTER RIDE! So 007 of us!